Most of us are, hopefully, preparing for a summer break! Why not take some time to read about the dog world in dogdotcom and to count our blessings? In a little more than one month, many will gather in Helsinki for what could be the biggest FCI World Dog Show ever: the registration are more than promising and, Finland being a doggy country, we can expect a high participation! 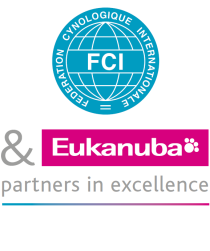 This year's FCI World Dog Show, which is being organised by the Finnish Kennel Club, may become the world's largest canine event if registrations keep coming in so strongly. Some 12,000 dogs have already been signed up now that the initial registration period has ended. In the February issue of dogdotcom, we told you about an initiative launched by the FCI in Thuin: dogs visiting the local nursing home residents. Toy dogs have big personalities, sometimes much bigger than their small bodies would suggest. But whilst body size does not affect a dog’s character, it does affect its growth rate and life expectancy. I bought my first show dog in 1965, a Pug that became a Group winner and a famous stud dog. In a few words, I was hooked to this hobby and have been ever since! About twenty kids had a reading experience with „Listening Dogs“ in Himmaste Public Library last Friday. The kids were visited by Afghan Hound Tentel and young Newfoundland Leero together with their owners-handlers Jane and Meeli. The last few years the Raad van Beheer (Dutch Kennelclub) has been working hard to improve the breeding of pedigree dogs in the Netherlands. We would like to update the FCI members and bring the following to the attention of the FCI. The Société Centrale Canine was established in 1881 in Paris at the Cercle de la Chasse (The Hunt Circle), a section of the Jockey Club. The domestication of the wolf has led to an astonishing diversity of dog breeds in terms of size, weight, physique and general appearance. Nowadays, the domestication of the dog is a topic which arouses passion. It is a fact that archaeological knowledge continues to grow and, above all, the advent of molecular genetics and the accumulation of resulting data generates many questions and gives rise to passionate debates.